The Eagles announced that they have placed the franchise tag on sometimes troubled wide receiver DeSean Jackson. The franchise tender for a wide receiver in 2012 is projected to be worth $9.443 million in guaranteed base salary once the contract is signed. The Eagles had until 4pm ET on Monday, March 5 to use the tag, which allows the two sides to continue negotiations until July 15. 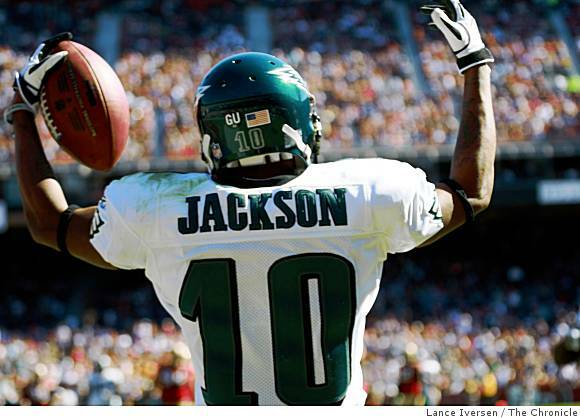 Selected with the 18th pick in the second round of the 2008 NFL Draft out of Cal, Jackson has 230 receptions for 4,096 yards with 21 touchdowns during his 60-game career with the Eagles. Jackson caught 125 passes for 2,079 yards and 11 touchdowns and demonstrated game-changing ability on punt returns in his first two seasons in the league, earning Pro Bowl honors after the 2009 season. Since then, Jackson has not been happy with his contract, but the 30 percent rule governing the uncapped season limited options towards an extension. As rookie, Jackson signed a four-year contract worth $3.469 million, a deal that included $1.353 million signing bonus. Jackson had another Pro Bowl season in 2010 and was a training camp holdout in 2011, but ended up playing for the league minimum, a 2011 CBA enhanced $600,000. Jackson caught 58 passes for 961 yards and four touchdowns last season and would certainly receive a mega-contract if he were allowed to hit the open market.